Perched on a slither of land in the extreme south-west of the UK, Cornwall is a place where you are guaranteed never to be that far from the sea. Here, past and present are intricately linked with the surrounding coastline and remnants of Cornwall's maritime heritage are everywhere. Fishing boats bob up and down in hidden harbours and there is always a chance to enjoy a pint of local ale in a cosy seaside inn. Quaint villages are awash with tales of smugglers' derring-do (heroic courage). As you would expect, fishing has always played an important part of life in Cornwall - and it still does so today. But so too does tourism, in the summer months at least. On Cornwall's northern coast, broad sandy beaches have become a haven for families, along with young, trendy holidaymakers. In seaside resorts like Newquay and Bude, you'd be hard pressed to find a good spot on sand or surf on a nice day. At the beach in Polzeath, Princes William and Harry have been known to be amongst those trying their hand at surfing. In the west, Cornwall's industrial heritage comes to the fore. Abandoned tin mines offer an enigmatic glimpse into another, much harsher world. Those who venture to Cornwall's southern coast come to enjoy its secluded coves and creeks, as well as the rugged cliffs that are great just for the sheer pleasure of wandering along. In these more rural spots, Cornwall can become an altogether more sedate experience. Cornwall is also renowned for enjoying a remarkably mild climate, something that is certainly a boon for holidaymakers and exotic flowers, as the Lost Gardens of Heligan display so well in the spring and summer months. The Eden Project, a series of space-age style greenhouses near St. Austell, takes the tropical theme one step further. 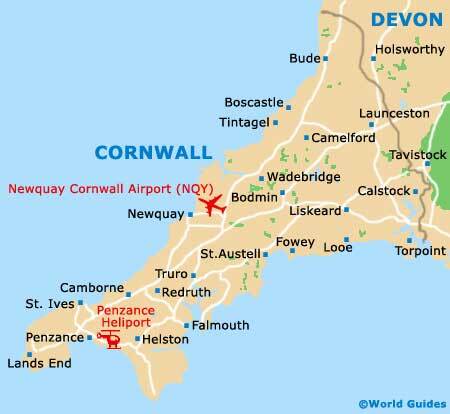 The most south-westerly tip of land in Cornwall, known as Land's End, is a magnet for tourists, as well as for those intent on traversing the whole of the British Isles mainland, ending up in John O'Groats in Scotland. It is become a tradition to pose for photographs at the signpost here before setting out on an epic walk, cycle or run across the country. Far more than just a popular Cornish seaside resort, Falmouth contains large working docks, a natural harbour and a very youthful vibe. Visitors to Falmouth will find beaches, harbour cruises, sailing regattas, and a 16th-century fortress. Due in no small part to its strong waves and perfect surfing conditions, tourism in Newquay is flourishing and this town is amongst Cornwall's most visited. Newquay is a perfect holiday resort for all ages, with many family friendly beaches. The town of Penzance is one of Cornwall's true treasures and is conveniently close to a seemingly endless supply of sandy beaches and waterfront attractions. Always worth visiting in the Penzance area is St. Michael's Mount and Land's End. Known for its scenic harbour and golden sandy beaches, St. Ives is one of Cornwall's most popular seaside towns and soon fills up during the summer months. In recent years, the new Tate Gallery has brought much prosperity to St. Ives. With a historic Cornish tin mining past, Truro has become an important cathedral city and exudes and unmistakable elegance and charm. Truro comprises some exceptional Georgian buildings and stands next to the Allen and Kenwyn rivers.